The AQUA SOLUTIONS' Model 2635S2 is also available in a Single module version: Model 2635S1. Ultimately, dual-module systems cost less to operate. This model is also available for high flow, high capacity applications such as glassware washing: Model 2635S2-DW11 and Model 2635S2-DW. AQUA SOLUTIONS' Type II DI lab water purification systems are designed from the ground up to be user-installable and user-serviceable! 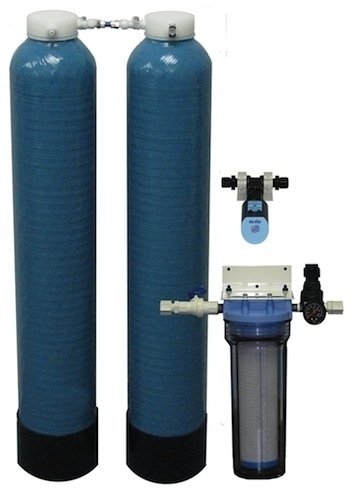 This dual tank 6-LPM Type II/III DI System is designed for applications that require up 160-Liters of Type II/III DI water/day, when fed tap water containing up to 340 PPM of total dissolved solids. The system includes two installed plus one spare 7" (178mm) diameter by 37" (940mm) tall DI tanks, an activated carbon prefilter assembly with pressure regulator and gauge, and a purity monitor light. The system includes two installed plus one spare DI module. The sensor displays a Green LED when water quality is >2-megohm-cm and a Red LED flashes when it’s time to change DI Modules. Ion Exchange Capacity of 12,000 Grains. You purchase and own the system hardware at a reasonable cost. The system is so easy to install, you can do it yourself. You can install the spare DI tank yourself, whenever you need it - even on weekends! If the DI tank exhausts in the middle of an experiment, or during a weekend, you can install the spare tank. See for yourself - compare the total cost of our Type II/III DI systems with the competition. Purity Sensor The sensor displays a Green LED when water quality is >2-megohm-cm and a Red LED flashes when it’s time to change DI Modules. No monthly rental charges You purchase and own the system hardware at a reasonable cost. No installation charges The system is so easy to install, you can do it yourself. No service charges You can install the spare DI tank yourself, whenever you need it - even on weekends! It puts you in control If the DI tank exhausts in the middle of an experiment, or during a weekend, you can install the spare tank. Competitively priced See for yourself - compare the total cost of our Type II/III DI systems with the competition. UV2006S UV Sterilizer - Prevents the growth of microorganisms within the system. Input Power Requires a 110V outlet within 5 ft. of the purity sensor.